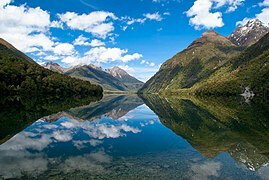 New Zealand is identified as one of the world's most stable and well-governed states. As at 2017, the country was ranked fourth in the strength of its democratic institutions, and first in government transparency and lack of corruption. A 2017 Human Rights Report by the U.S. Department of State noted that the government generally respected the rights of individuals, but voiced concerns regarding the social status of the Māori population. New Zealand ranks highly for civic participation in the political process, with 77% voter turnout during recent elections, compared to an OECD average of 69%. In 1951 the United Kingdom became increasingly focused on its European interests, while New Zealand joined Australia and the United States in the ANZUS security treaty. The influence of the United States on New Zealand weakened following protests over the Vietnam War, the refusal of the United States to admonish France after the sinking of the Rainbow Warrior, disagreements over environmental and agricultural trade issues and New Zealand's nuclear-free policy. 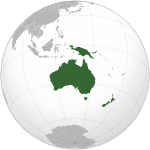 Despite the United States' suspension of ANZUS obligations the treaty remained in effect between New Zealand and Australia, whose foreign policy has followed a similar historical trend. Close political contact is maintained between the two countries, with free trade agreements and travel arrangements that allow citizens to visit, live and work in both countries without restrictions. In 2013 there were about 650,000 New Zealand citizens living in Australia, which is equivalent to 15% of the resident population of New Zealand. New Zealand has an advanced market economy, ranked 16th in the 2018 Human Development Index and third in the 2018 Index of Economic Freedom. It is a high-income economy with a nominal gross domestic product (GDP) per capita of US$36,254. The currency is the New Zealand dollar, informally known as the "Kiwi dollar"; it also circulates in the Cook Islands (see Cook Islands dollar), Niue, Tokelau, and the Pitcairn Islands. New Zealand is heavily dependent on international trade, particularly in agricultural products. Exports account for 24% of its output, making New Zealand vulnerable to international commodity prices and global economic slowdowns. Food products made up 55% of the value of all the country's exports in 2014; wood was the second largest earner (7%). New Zealand's main trading partners, as at June 2018, are China (NZ$27.8b), Australia ($26.2b), the European Union ($22.9b), the United States ($17.6b), and Japan ($8.4b). On 7 April 2008, New Zealand and China signed the New Zealand–China Free Trade Agreement, the first such agreement China has signed with a developed country. The service sector is the largest sector in the economy, followed by manufacturing and construction and then farming and raw material extraction. Tourism plays a significant role in the economy, contributing $12.9 billion (or 5.6%) to New Zealand's total GDP and supporting 7.5% of the total workforce in 2016. International visitor arrivals are expected to increase at a rate of 5.4% annually up to 2022. New Zealand's transport network comprises 94,000 kilometres (58,410 mi) of roads, including 199 kilometres (124 mi) of motorways, and 4,128 kilometres (2,565 mi) of railway lines. Most major cities and towns are linked by bus services, although the private car is the predominant mode of transport. The railways were privatised in 1993, but were re-nationalised by the government in stages between 2004 and 2008. The state-owned enterprise KiwiRail now operates the railways, with the exception of commuter services in Auckland and Wellington which are operated by Transdev and Metlink, respectively. Railways run the length of the country, although most lines now carry freight rather than passengers. Most international visitors arrive via air and New Zealand has six international airports, but currently only the Auckland and Christchurch airports connect directly with countries other than Australia or Fiji. The New Zealand Post Office had a monopoly over telecommunications until 1987 when Telecom New Zealand was formed, initially as a state-owned enterprise and then privatised in 1990. Chorus, which was split from Telecom (now Spark) in 2011, still owns the majority of the telecommunications infrastructure, but competition from other providers has increased. A large-scale rollout of gigabit-capable fibre to the premises, branded as Ultra-Fast Broadband, began in 2009 with a target of being available to 87% of the population by 2022. As of 2017, the United Nations International Telecommunication Union ranks New Zealand 13th in the development of information and communications infrastructure. Life expectancy for New Zealanders in 2012 was 84 years for females, and 80.2 years for males. Life expectancy at birth is forecast to increase from 80 years to 85 years in 2050 and infant mortality is expected to decline. New Zealand's fertility rate of 2.1 is relatively high for a developed country, and natural births account for a significant proportion of population growth. Consequently, the country has a young population compared to most industrialised nations, with 20% of New Zealanders being 14 years old or younger. By 2050 the median age is projected to rise from 36 years to 43 years and the percentage of people 60 years of age and older to rise from 18% to 29%. In 2008, the leading cause of premature death was cancer, at 29.8%, followed by ischaemic heart disease, 19.7%, and then cerebrovascular disease, 9.2%. As of 2016, total expenditure on health care (including private sector spending) is 9.2% of GDP. Public radio was introduced in New Zealand in 1922. A state-owned television service began in 1960. Deregulation in the 1980s saw a sudden increase in the numbers of radio and television stations. New Zealand television primarily broadcasts American and British programming, along with a large number of Australian and local shows. The number of New Zealand films significantly increased during the 1970s. In 1978 the New Zealand Film Commission started assisting local film-makers and many films attained a world audience, some receiving international acknowledgement. The highest-grossing New Zealand films are Hunt for the Wilderpeople, Boy, The World's Fastest Indian, Once Were Warriors and Whale Rider. 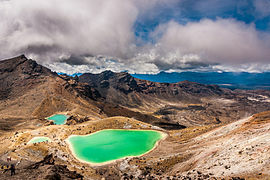 The country's diverse scenery and compact size, plus government incentives, have encouraged some producers to shoot big-budget productions in New Zealand, including Avatar, The Lord of the Rings, The Hobbit, The Chronicles of Narnia, King Kong and The Last Samurai. The New Zealand media industry is dominated by a small number of companies, most of which are foreign-owned, although the state retains ownership of some television and radio stations. Since 1994, Freedom House has consistently ranked New Zealand's press freedom in the top twenty, with the 19th freest media in 2015. Anna Hélène Paquin ( PAK-win; born 24 July 1982) is a New Zealand-Canadian actress. She was born in Manitoba and brought up in Wellington, New Zealand, before moving to Los Angeles during her youth. She completed a year at Columbia University, before leaving to focus on her acting career. As a child, she played the role of Flora McGrath in Jane Campion's romantic drama film The Piano (1993), despite having had little acting experience. For her performance, she received the Academy Award for Best Supporting Actress at the age of 11, making her the second-youngest winner in Oscar history.Paquin was a successful child actress, receiving multiple Young Artist Award nominations for her roles in Fly Away Home (1996), The Member of the Wedding (1997), and A Walk on the Moon (1999), and was nominated for a Screen Actors Guild Award for Outstanding Performance by a Cast in a Motion Picture for appearing in Cameron Crowe's comedy-drama film Almost Famous (2000). She played mutant superheroine Rogue in multiple films of the X-Men franchise and was nominated for a Saturn Award for her performance in the first installment. Anzac Day () is a national day of remembrance in Australia and New Zealand that broadly commemorates all Australians and New Zealanders "who served and died in all wars, conflicts, and peacekeeping operations" and "the contribution and suffering of all those who have served". Observed on 25 April each year, Anzac Day was originally devised to honour the members of the Australian and New Zealand Army Corps (ANZAC) who served in the Gallipoli Campaign, their first engagement in the First World War (1914–1918). Auckland ( AWK-lənd) is a city in the North Island of New Zealand. Auckland is the largest urban area in the country, with an urban population of around 1,628,900 (June 2018). It is located in the Auckland Region—the area governed by Auckland Council—which includes outlying rural areas and the islands of the Hauraki Gulf, resulting in a total population of 1,695,900. A diverse and multicultural city, Auckland is home to the largest Polynesian population in the world. The Māori-language name for Auckland is Tāmaki ([ˈtaːmaki]) or Tāmaki-makau-rau, meaning "Tāmaki with a hundred lovers", in reference to the desirability of its fertile land at the hub of waterways in all directions.The Auckland urban area (as defined by Statistics New Zealand) ranges to Waiwera in the north, Kumeu in the north-west, and Runciman in the south. Auckland lies between the Hauraki Gulf of the Pacific Ocean to the east, the low Hunua Ranges to the south-east, the Manukau Harbour to the south-west, and the Waitakere Ranges and smaller ranges to the west and north-west. The surrounding hills are covered in rainforest and the landscape is dotted with dozens of dormant volcanic cones. The central part of the urban area occupies a narrow isthmus between the Manukau Harbour on the Tasman Sea and the Waitematā Harbour on the Pacific Ocean. Auckland is one of the few cities in the world to have a harbour on each of two separate major bodies of water. The Christchurch mosque shootings were two consecutive terrorist attacks at mosques in Christchurch, New Zealand, during Friday Prayer on 15 March 2019. The attacks began at the Al Noor Mosque in the suburb of Riccarton at 1:40 pm and continued at the Linwood Islamic Centre at about 1:55 pm. The gunman live-streamed the first attack on Facebook Live.The attacks killed 50 people and injured 50 others. A 28-year-old Australian man, described in media reports as a white supremacist and part of the alt-right, was arrested and charged with murder. The attacks have been linked to an increase in white supremacism and alt-right extremism globally observed since the mid-2010s. Politicians and world leaders condemned the attacks, and Prime Minister Jacinda Ardern described it as "one of New Zealand's darkest days." The government has established a royal commission of inquiry into its security agencies in the wake of the attacks, which are the deadliest mass shootings in modern New Zealand history. The Cook Islands (Cook Islands Māori: Kūki 'Āirani) is a self-governing island country in the South Pacific Ocean in free association with New Zealand. It comprises 15 islands whose total land area is 240 square kilometres (92.7 sq mi). The Cook Islands' Exclusive Economic Zone (EEZ) covers 1,800,000 square kilometres (690,000 sq mi) of ocean.New Zealand is responsible for the Cook Islands' defence and foreign affairs, but they are exercised in consultation with the Cook Islands. In recent times, the Cook Islands have adopted an increasingly independent foreign policy. Although Cook Islanders are citizens of New Zealand, they have the status of Cook Islands nationals, which is not given to other New Zealand citizens. The Cook Islands has been an active member of the Pacific Community since 1980. The Cook Islands' main population centres are on the island of Rarotonga (10,572 in 2011), where there is an international airport. There is a larger population of Cook Islanders in New Zealand itself; in the 2013 census, 61,839 people said they were Cook Islanders, or of Cook Islands descent.With about 100,000 visitors travelling to the islands in the 2010–11 financial year, tourism is the country's main industry, and the leading element of the economy, ahead of offshore banking, pearls, and marine and fruit exports. In March 2019 it was reported that the Cook Islands had plans to change its name and remove the reference to Captain James Cook in favour of "a title that reflects its 'Polynesian nature'". Sir Edmund Percival Hillary (20 July 1919 – 11 January 2008) was a New Zealand mountaineer, explorer, and philanthropist. On 29 May 1953, Hillary and Nepalese Sherpa mountaineer Tenzing Norgay became the first climbers confirmed to have reached the summit of Mount Everest. They were part of the ninth British expedition to Everest, led by John Hunt. From 1985 to 1988 he served as New Zealand's High Commissioner to India and Bangladesh and concurrently as Ambassador to Nepal. The New Zealand national cricket team, nicknamed the Black Caps, played their first Test in 1930 against England in Christchurch, becoming the fifth country to play Test cricket. From 1930 New Zealand had to wait until 1956, more than 26 years, for its first Test victory, against the West Indies at Eden Park in Auckland. They played their first ODI in the 1972–73 season against Pakistan in Christchurch. The current Test, One-day and Twenty20 captain is Kane Williamson, who replaced Brendon McCullum who announced his retirement in late December 2015. The national team is organised by New Zealand Cricket. As of 12 March 2019, New Zealand have played 1309 Internationals, winning 496, losing 594, tying 11 and drawing 165 matches while 43 matches ended yielding no result. The team is ranked 2nd in Tests, 3rd in ODIs and 6th in T20Is by the ICC. New Zealand defeated South Africa in the semi final of Cricket World Cup 2015 which was their first win in the a world cup semi final and hence they made their maiden appearance in a World Cup Final. Sir Peter Robert Jackson (born 31 October 1961) is a New Zealand film director, screenwriter, and film producer. He is best known as the director, writer, and producer of the Lord of the Rings trilogy (2001–03) and the Hobbit trilogy (2012–14), both of which are adapted from the novels of the same name by J. R. R. Tolkien. Other films include the critically lauded drama Heavenly Creatures (1994), the mockumentary film Forgotten Silver (1995), the horror comedy The Frighteners (1996), the epic monster remake film King Kong (2005), the supernatural drama film The Lovely Bones (2009), and the World War I documentary film They Shall Not Grow Old (2018). He produced District 9 (2009), The Adventures of Tintin: The Secret of the Unicorn (2011), West of Memphis (2012), and Mortal Engines (2018). 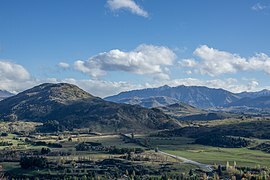 Nigel John Dermot Neill (born 14 September 1947), known professionally as Sam Neill, is a New Zealand actor, writer, producer, director, and vineyard owner. Born in Omagh, Northern Ireland, he moved to Christchurch with his family in 1954. Neill first achieved recognition with his appearance in the 1977 film Sleeping Dogs, which he followed with leading roles in My Brilliant Career (1979), Omen III: The Final Conflict, Possession (both 1981), A Cry in the Dark (1988), Dead Calm (1989), and The Piano (1993). He came to international prominence with his portrayal of Dr. Alan Grant in Jurassic Park (1993), reprising the role in 2001's Jurassic Park III. Wellington (Māori: Te Whanganui-a-Tara [tɛ ˈfaŋanʉi a taɾa]) is the capital city and second most populous urban area of New Zealand, with 418,500 residents. 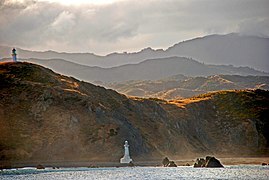 It is located at the south-western tip of the North Island, between Cook Strait and the Remutaka Range. Wellington is the major population centre of the southern North Island, and is the administrative centre of the Wellington Region, which also includes the Kapiti Coast and Wairarapa. Its latitude is 41°17′S, making it the world's southernmost capital of a sovereign state. Wellington features a temperate maritime climate, and is the world's windiest city by average wind speed.The Wellington urban area comprises four local authorities: Wellington City, on the peninsula between Cook Strait and Wellington Harbour, contains the central business district and about half the population; Porirua on Porirua Harbour to the north is notable for its large Māori and Pacific Island communities; Lower Hutt and Upper Hutt are largely suburban areas to the northeast, together known as the Hutt Valley. As the nation's capital since 1865, the New Zealand Government and Parliament, Supreme Court and most of the public service are based in the city. Architectural sights include the Government Building—one of the largest wooden buildings in the world—as well as the iconic Beehive. Wellington is also home to several of the largest and oldest cultural institutions in the nation such the National Archives, the National Library, the Museum of New Zealand Te Papa Tongarewa, and numerous theatres. It plays host to many artistic and cultural organisations, including the New Zealand Symphony Orchestra and Royal New Zealand Ballet. One of the world's most liveable cities, the 2016 Mercer Quality of Living Survey ranked Wellington 12th in the world.Wellington's economy is primarily service-based, with an emphasis on finance, business services, and government. It is the centre of New Zealand's film and special effects industries, and increasingly a hub for information technology and innovation, with two public research universities. Wellington is one of New Zealand's chief seaports and serves both domestic and international shipping. The city is served by Wellington International Airport, the third busiest airport in the country. Wellington's transport network includes train and bus lines which reach as far as the Kapiti Coast and Wairarapa, and ferries connect the city to the South Island.